So who are the Millennials? They have been defined as Generation Y, Generation Me, and Digital Natives. How do Millennials compare to previous generations? Millennials are individuals born between 1981-1996. They are the largest generation on the planet and are 80 million strong in the U.S. alone. By 2025, they will make up 75% of the workforce. Among the things we know about Millennials is that they’re the most educated group in history – 61% of them have attended college versus 46% of Boomers. They also want to continue to learn, with well over half saying they’d choose a job for its personal growth potential and educational opportunities over salary. Millennials are the first generation in history who have grown up constantly connected to the world of digital technology, what the Pew Research Center has labeled “Digital natives in a land of digital immigrants.” Without a doubt, Millennials have embraced technology like no other generation. 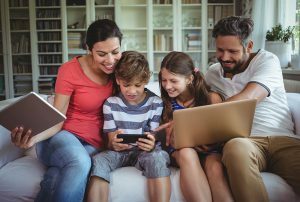 Millennials clearly adapt faster to computer and internet services because they have always had them. They are the most likely to say that technology makes life easy rather than harder, that it brings people closer together than drives them further apart, and that technology allows people to use their time more efficiently. Technology and the internet have fundamentally shaped how they think, communicate, work, problem solve, buy, and parent. Some have “nomophobia” – a fear of being away from their smartphone. Millennials use their phone for research. There’s an acronym they use: KBYG (Know Before You Go). They read an average of five reviews before visiting a store or center. They live their lives on Facebook. Eighty-one percent of Millennial parents have shared pictures of their children on social media. Most of them are not shy or conflicted about sharing their children’s lives online. They love their phones—they just don’t want to talk on them! In 2017 Millennials made up 90% of all new parents. They are more likely to say that parenthood is a major part of their identity than previous generations. While they may have waited longer to get married or have children, Millennial moms and dads don’t just want to be parents; they are ready to be parents. Family is a priority for them. They are raising their children to be independent, creative and adventurous, educated, compassionate, purposeful, and to value experiences over possessions. They have a need for non-traditional hours of care. Millennial parents may rely on providers offering non-traditional hours of care (i.e. outside the typical 6 a.m. to 6 p.m. timeframe). Approximately 40 percent of student parents take on full-time work and approximately half are unmarried. This highlights a population with a high demand schedule and a lack of additional support for child care within the household. Child care is more than just a service. For Millennial parents – and in fact all parents in our increasingly education-focused society – child care isn’t just a service to get parents to work, but one that helps get children to school. Millennial parents aren’t just thinking about care; they’re thinking about learning. Without a curriculum program that supports important milestones and follows children through key ages, child care is just a temporary solution that must be rethought every time a child reaches a new developmental stage – such as when a toddler becomes a preschooler. Access bill and update payment information as needed through the online parent portal. Communicate the way they communicate. A Millennial mom’s primary objective in using technology is for scheduling and to stay in touch with their families. Their smartphone is their lifeline and that’s the way they’d like to communicate with you; they prefer texting rather than talking. Parents want information electronically rather than on paper. Offering paperless options like e-newsletters, daily highlights and accomplishments, photos, alerts and reminders ensure that parents receive real-time information about their child’s day. Every center, at a minimum, should have a Facebook or Instagram account as a means of promoting their center, providing notifications, and engaging with parents and the community. Roughly 90% of Millennial moms share information about purchases on social media and 74% ask for recommendations before making purchases. These online reviews are critical for nearly every purchasing decision made today. Reviews and testimonials should be a key focus for your childcare center as Millennial parents take these reviews very seriously. Millennial parents are aware, informed and engaged. While technology and immediate information are important, you’ll always want a balance between electronic and other comparable methods of communication. Parents rely on you to care for their children while they’re away, and you’re well-equipped to provide the human connection they need. Positive Steps for Back-to-School SuccessOctober is Fire Prevention Month: Be Aware. Fire Can Happen Anywhere.